There may come a time when you might need to take food away from your dog, possibly for his own safety. 1) Prep your dog by putting his lead on him. You’ll need assistance from another person, strong enough to control the dog on a lead. 2) In a quiet room, slowly place a bowl of a small portion of rice or plain biscuit food towards your dog and let him have a few mouthfuls. 3) Slowly offer a more tasty food, such as small pieces of cooked chicken to draw his attention from the rice. 4) Once the chicken or other tasty alternative has been eaten stay where you are and do not offer any more until the dog returns to the bland food in the bowl. 5) When he does, offer some more of the tasty food. Once you’ve tried this several times. Walk away and approach the dog slowly offering him chicken when you reach the bowl. Eventually, your approach should be less intimidating as it will be associated with a nicer and more interesting alternative to the bland food. 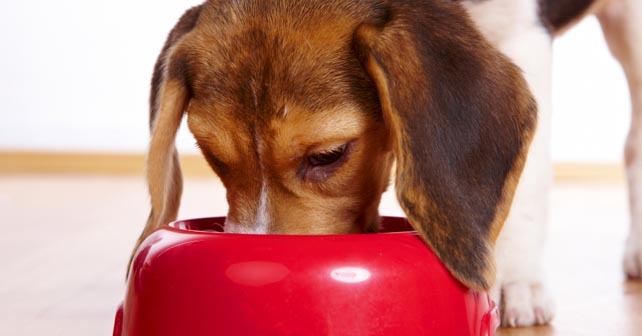 Top 5 foods your must Never feed your Dog.